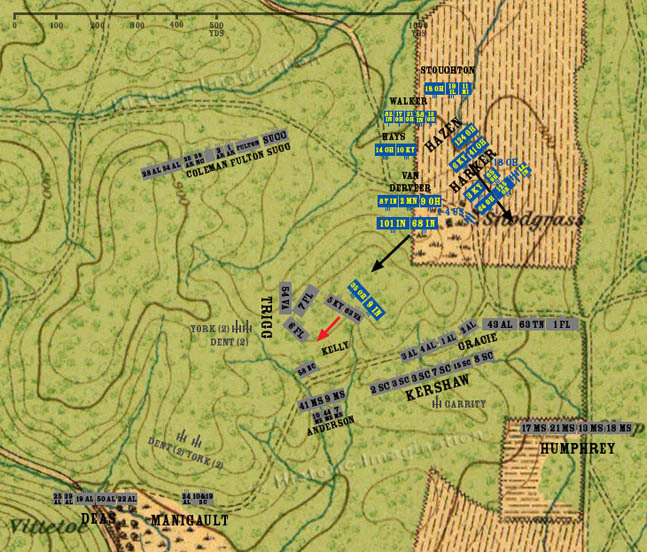 The 5th Kentucky and 63rd Virginia or Kelly’s Brigade advance on Hill Two after capturing Hill Three. A volley from the 35th Ohio and 9th Indiana, the last of the Federal ammunition, sends them scrambling back into the darkness. The 68th and 101st Indiana march toward Hill Two to relieve the regiments there. General Hazen sends the 6th Kentucky into the woods beyond the cornfield in a skirmish line to find the Confederates.